Garrett Kern, Carter Hansen and Westin Kirk combined for 65 points in the Knights' 87-70 victory. With no starter taller than 6-foot-1, Russell-Tyler-Ruthton has to depend on other things to win basketball games. The Knights (31-1) used 15 steals and shot 59 percent from the field to pull away from the Jaguars (26-5) for an 87-70 victory in the Class 1A quarterfinals Thursday at Williams Arena. Five players each had three steals for the Knights, who are averaging 14 steals per game. Hinckley-Finlayson’s Travis Visser scored 11 points in the first five minutes to help the Jaguars open a 16-12 lead. But the Knights responded with a 22-5 run to take a 34-21 lead with six minutes left in the first half. The Knights, who led 46-34 at halftime, opened the second half with a 10-2 run to take an 18-point lead. The Jaguars managed to get within seven midway through the second half, but couldn’t get closer. Garrett Kern scored 29 points, Westin Kirk scored 20 and Carter Hansen added 16 for the Knights. Visser led the Jaguars with 18 points and 12 rebounds. 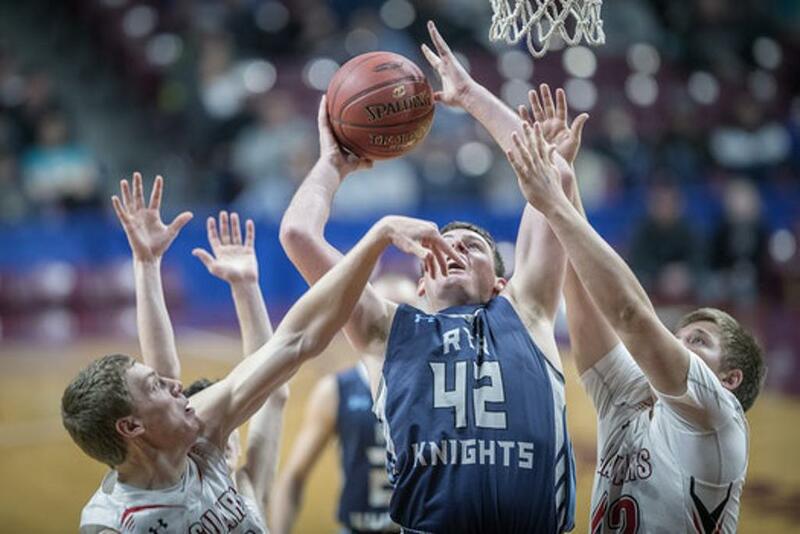 Garrett Kern, Carter Hansen and Westin Kirk combined for 65 points to lead Russell-Tyler-Ruthton to an 87-70 victory over Hinckley-Finlayson in the Class 1A quarterfinals Thursday at Williams Arena. Kern scored 29, Kirk scored 20 and Hansen scored 16 for the fourth-seeded Knights (31-1), who didn’t trail in the final 32 minutes of the game. Kern scored 17 in the first half to help the Knights open a 46-34 lead at halftime. The Knights built an 18-point lead early in the second half. The fifth-seeded Jaguars (26-5), making their first state tournament appearance, managed to get within seven points midway through the second half but couldn’t get any closer. Travis Visser led the Jaguars with 18 points.